Yogis say we are as old as our spine! The young at heart don’t feel their age, nor do they let it stop them from being adventurous! Teaching yoga is full of surprises and unexpected visions of strength. In particular, when it’s time for inversions, people often surprise themselves. Recently, at a Friday morning LA Fitness yoga class, we decide to explore handstands. 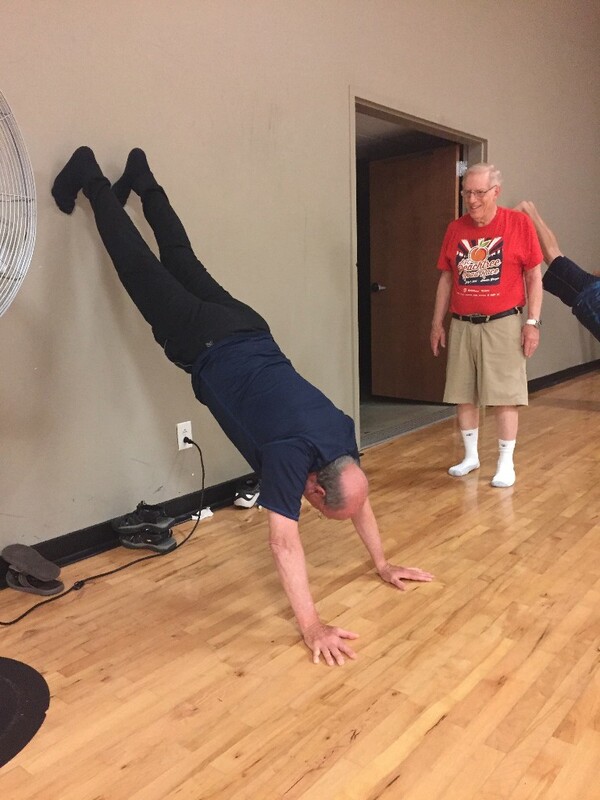 To my amazement, one of the senior members displayed his incredible strength by effortlessly walking up the wall after my yoga demonstration. It caught my attention from way across the room. Yet, I had enough time to walk over to him, walk back to the front, grab my phone, and take a camera shot, while he continued to hold the pose. He came back down to the floor, like he was ready to do another set of them. When I asked him how often he practiced, he said only once in awhile. I wanted to share the photo with you because it has been my favorite photo shot of the month. I am inspired by his mind, pushing beyond what society expects that he can and can’t do. Currently, the best place to find me for an all levels class is LA Fitness in Sandy Springs on Fridays 8:30-9:30am. I am teaching a couple of other senior yoga classes that are chair yoga classes. My Lead Instructor for Health Sciences position at Atlanta School of Massage and working with private clients takes up a good part of my week. I may add a class or two for all levels yoga in the future and post the info in the monthly yoga news. A special thank you to those who responded to our first yoga tribe on May 24th! 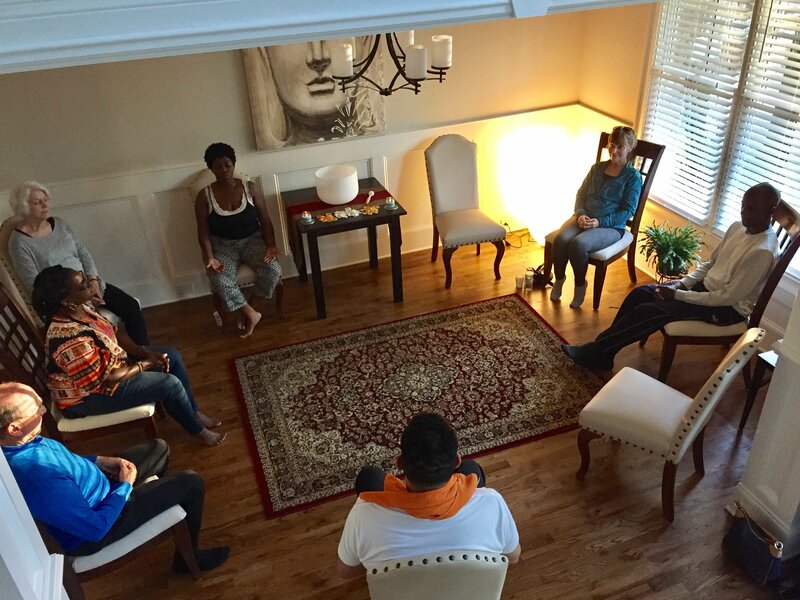 We started with a little social for people to meet up, followed by some chair yoga, breathing exercises, guided meditation and celestial sounds of the crystal singing bowl. Home made herbal tea and cookies were served. It was such a fun time, I have already planned the next one! It will be Wed. June 21st 7:00-8:00pm. Please email me if you would like to reserve a spot. More info is on http://www.amma.org under US Tours. Prayers and blessings to all those who have made sacrifices for our freedom. Thinking of you with heartfelt gratitude on Memorial Day! Thanks everyone for tuning in to yoga news. Looking forward to seeing you soon and sharing some yoga vibes!